My mother would have called her a pistol, this bright and bubbly, willful and irrepressible adolescent Jewish girl Anne Frank. Is there a chronicle in Western culture more famous, or more grievous, than hers? 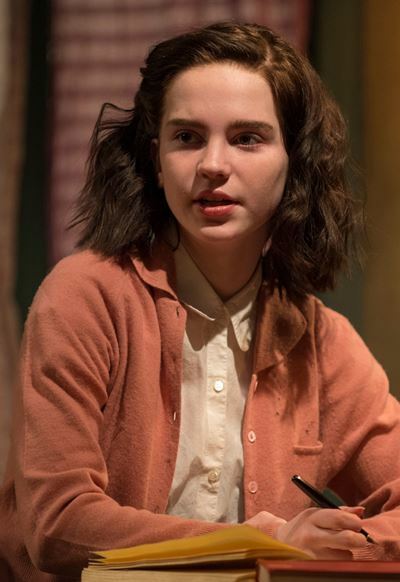 Yet what makes Frances Goodrich and Albert Hackett’s 1955 play “The Diary of Anne Frank” so compelling – and it is nothing less in the current production at Writers Theatre – fills a larger frame of human drama. It is a complex profile of hope shadowed by terror and despair, and finally crushed under the boot of hatred. But still, first, there is innocent hope, a luminous vision of life abounding in wonder, possibility and good. Watching young Sophie Thatcher’s rambunctious, delightful and wise performance as Anne, I couldn’t help making a bizarre connection with Eloise at the Plaza. Of all the birds that might be closely caged with seven others, this feisty humming bird may be the least likely to adapt. If Anne was going to be locked away from sunlight and the wide world, she should at least have several floors to explore, rooms to dart through and space for her formidable intellect to expand. But Anne’s family – mother Edith, father Otto, sister Margot – and the three members of another Jewish family consider themselves fortunate to have this cramped upstairs hideaway in an Amsterdam office building. It’s their refuge from the Nazis’ relentless hunt for Jews to be shipped off to the camps. Though effectively prisoners even here, the two families – soon joined by a dentist – at least enjoy a steady stream of basic supplies scraped together by a sympathetic, and quite courageous, woman who is not Jewish (the radiant, empathic Leah Karpel). Thus the parallel narratives, Anne’s flowering into young womanhood and the stress-ridden arc of eight souls forced together by narrow walls, unfolds over a period of more than a year. If ever there was ensemble theater, this is it, and Writers’ fine company directed by Kimberly Senior gets down to the very fiber of human reckoning, of valiant mutual accommodation thrown against personal frailty and ravaging fear. 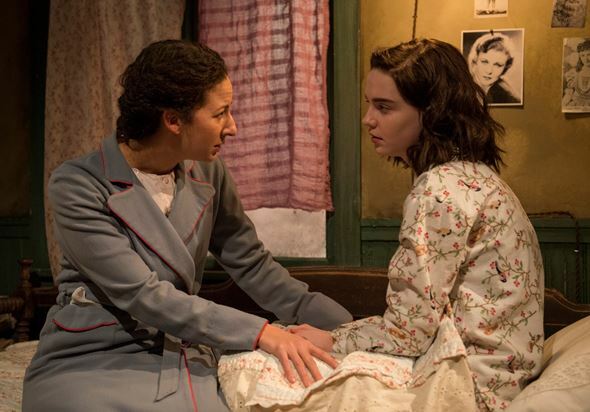 “The Diary of Anne Frank” might be called children’s story with an adult twist: It’s the grown-ups, not the young people, who are preoccupied with the terror that lurks just outside the door of this tiny commune. They all have nightmares, kids and adults alike, but the greater weight of the situation clearly falls on the tall people. During the day, silence reigns, lest these refugees betray themselves to workers in the building. At night, however, pent-up anxiety flares, frustrations erupt, accusations get tossed around like balls at recess. Sean Fortunato and Kristina Valada-Viars present a warm-hearted pair as Anne’s parents, he the intellectual and moral anchor of this constrained community and she the generous support group of one. 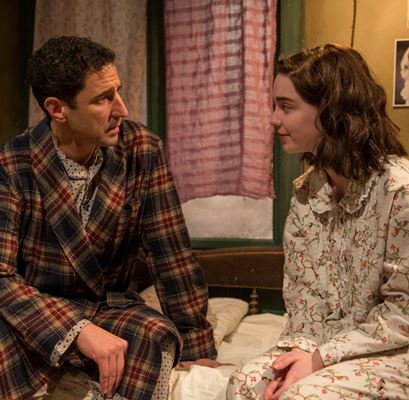 Edith Frank bears a personal burden: Smart, gifted, petulant Anne feels no connection to her mother, but she’s devoted to her father. Valada-Viars negotiates the woman’s emotionally thorny path with agility, layering a mother’s love and pain with the constant fear of capture and death. Perhaps more intriguing as a married couple, because of more volatile issues between them, are Lance Baker and Heidi Kettenring as the Mr. and Mrs. van Daan. He is Otto Frank’s business partner. She is a classic princess, albeit a presentable cook. He is increasingly put upon by Anne’s boisterous behavior; she clings to her fur coat as the last remaining token of a normal, meaning privileged, life that now seems little more than a memory. Tossed into this mix is the dentist, Mr. Dussel (Kevin Gudahl), who has an almost psychotic aversion to cats. Young Peter van Daan (Antonio Zhiurinskas) has a cat. Between the complaining of van Daan and the carping of Dussel, life in this barracks of dread is made even more trying. But meanwhile, the kids are crossing that divide between childhood and life’s next chapter. Herein lies the real beauty of Thatcher’s portrayal, as she takes Anne from childish narcissism to mature awareness of her place in a world now shrunk within the borders of this little room. She learns to give space to the irascible dentist Dussel, by necessity her roommate. 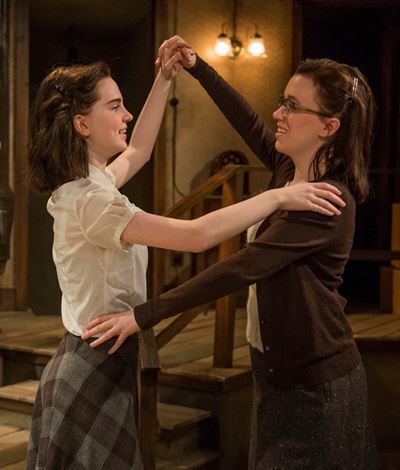 And she embraces her older sister Margot (Lila Morse), the more deferential and not so precocious one. Central to Anne’s new consciousness is her sexual awakening. 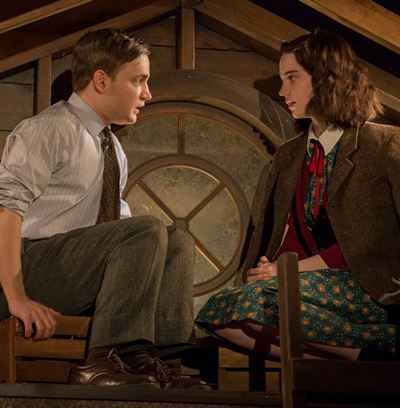 Thatcher’s emergent Anne and Zhiurinskas’ appreciative Peter begin to see each other in a new light, and their mutual attraction becomes a charming diversion for a group that, despite all differences, shares a collective memory of youth and first love. And still ominous reality hovers: It will come through that door. Whether sooner or later, it will come, inexorable, inescapable and horrific.